A springtime rose makes us all feel good. But do we act and feel, as we should. Do the splendours of creation remind us of God’s great gift? Why then does a single rose give us such a lift? 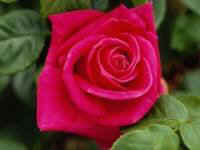 Yet a rose is only a micro part of the true Divine. We embrace a rose, but with God we do not always align. A rose is a beautiful fragment of God’s wonderful creation. We breathe in its fragrance and it fills us with such elation. When you hold a rose, spare a thought for the Lord of Love. His essence will gently fall upon from the heavens above.